More and more as I grow up I’ve found myself gravitating to two extremes. On one end there’s music defined by rhythms, very focused on eliciting a physical response of some sort. On the other, music that exists in a constant haze, obscuring its rhythmic core and stretching its melodic and harmonic motions into a blur. You could line up all of the albums that I’ve reviewed this year, and the ones I gave the highest scores to would fall on one side or the other*. One of the hardest parts of being a critic is trying to balance my inevitable personal biases with a more even keeled view of the material at hand. Ultimately, I don’t think it’s a bad thing for a critic to wear their tastes on their sleeves; seeing a writer get excited can only help engage a reader more, and some of my favorite pieces of music journalism focus on acts that the author is mostly indifferent to. The challenge comes in making the power of an album, something that often seems self-evident to me, clear to people who haven’t heard the album or don’t hear it the way I do. If you were to look up “beautiful” in my mental dictionary it’d just be a picture of Nepenthe. Out of the two categories I described in my opening paragraph, it falls squarely in the second, and ticks every possible box of how to do that style well. Ambient music is best when it can capture elements of daily life and elevate them to something otherworldly. Instead of building towards musical events, it creates sonic environments that suspend themselves in time; often feeling lived-in and vaguely familiar in an unconscious way. Barwick’s approach, looping her reverb-drenched voice on top of itself until the layers coalesce into a choir-like wave, places heavy emphasis on the ethereal and dream like elements of the genre. This is helped in part by the addition an actual choir this time around, giving Nepenthe a wider sonic palette to work with. Barwick is also joined by Alex Somers, who produced Valtari with Sigur Ros last year. But while that record had found an established act resting on their laurels (a slump that was thankfully broken this year by the incredible Kveikur**), this one has the makings of an artistic breakthrough for Barwick. The increased textural range goes beyond the increase in voices. Barwick has incorporated guitar and piano into her music before, but here those instruments, along with a string quartet, have a significantly greater role to the compositions. Where they previously served as beds for the endless waves of voices to glide over, here the strings take center stage on several songs, providing tense churning to “Pyrrhic” and soft accents to the lead melody on “Forever.” The guitar and piano are less upfront, but show up all over the album, establishing a presence in the lower register and warping themselves into less recognizable forms to deepen the complexity of the mix. 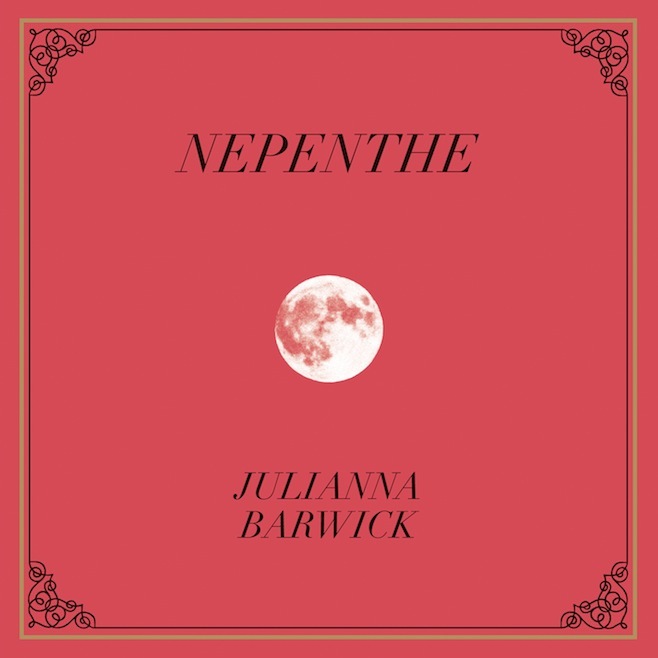 Not only are the compositions on Nepenthe more mature than Barwick’s older work; they’re also more immediate and accessible. This isn’t to say that Julianna has gone and written straightforward pop songs (although, honestly, that would be pretty awesome too), but that the emotional content is more acutely focused and evocative. Nepenthe balances the weight of loss with a quiet and reverent sense of spiritual hope. I was often reminded of listening to classical radio with my parents during the holiday seasons. The way the choral music seemed infinity sadder and even a bit terrifying in its luminosity during the winter stuck with me. Nepenthe feels similarly haunting and just out of reach. Even at its most overt, on “One Half” the only Julianna Barwick song with lyrics, all we get is a single phrase repeated without a clear resolution. The words may be clear, but it’s only a fragment of a thought, forcing the listener to draw their own conclusions about what it means. This need for an individualized interpretation is part of what makes Nepenthe, and ambient music in general, so powerful. The abstract, yet emotionally weighty, nature of the music will undoubtedly evoke something in the listener, but exactly what depends entirely on the associations that you have with the sounds you’re hearing. I hear winter, dim light at dusk and sparkling ice hanging from the edge of windowsills in the morning. In some ways, this is the most pure form of music that could exist, dependent as it is on the life of the listener to give it meaning and strength. I can do the best to describe what I found in the folds of Nepenthe’s unearthly beauty, but you could hear something else entirely. All I can do is urge you to give over to it, and by doing so, let it becoming meaningful in a way that is unique to you. *The exception being Sunbather, because it falls in both sides simultaneously, which probably explains why it’s now far and away my favorite record of the year. **I didn’t get to review this record when it came out because of Yeezus but basically, the reason it's good is that they shifted the focus to the drums and bass while still keeping all of their grand orchestrations up top. And it works. Very well.